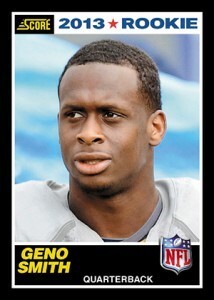 Geno Smith, one of the top projected quarterbacks in the 2013 NFL Draft has signed a trading card deal with Panini America. The agreement guarantees that Smith's autograph will appear in 2013 Panini products. He will also be featured on packaging and be involved in social media initiatives. The first Panini set to have Geno Smith will be 2013 Score Football, which is currently scheduled for a May release. Smith comes from West Virginia and is the Mountaineers' career leader in completions (988) and touchdown passes (98). Smith led West Virginia to an impressive 70-33 victory over Clemson in the 2012 Orange Bowl. The quarterback was named the game's MVP after throwing six touchdowns.